U.S. President Barack Obama's recent speech in Berlin indicates that he remains an "idealist with many illusions" when he proposes more vigorous nuclear reduction. Addressing a crowd at the Brandenburg Gate in Berlin on June 19, 2013, U.S. President Barack Obama could not but recall that, exactly 50 years earlier, another U.S. President, John Kennedy, had delivered his famous “Ich bin ein Berlliner” speech in Berlin. Obama recalled that fragment of Kennedy’s speech where the former president predicted the arrival of “peace with justice” in a world where freedom would triumph and Cold War dividing lines would disappear. Obama specified that part of this “peace with justice” should mean the following: an end to the proliferation of nuclear weapons, a diminishing role of nuclear weapons in the U.S. nuclear doctrine, a one-third cut in deployed Russian and U.S. strategic nuclear weapons, a reduction in the nonstrategic nuclear weapons of Russia and the United States, preventing Iran from obtaining nuclear weapons and nuclear disarmament of North Korea, in addition to early ratification by the United States of the Comprehensive Nuclear Test Ban Treaty (CNTBT). The American president made a similar call for nuclear disarmament in Prague, in May 2009. 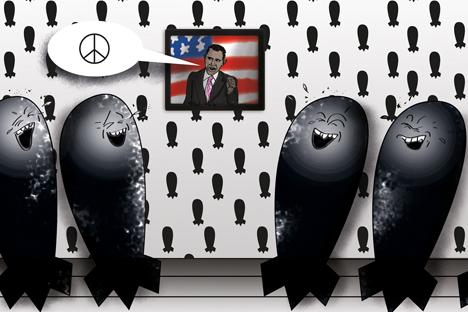 The main outcome of that Obama speech was the revival of nuclear disarmament talks, which led to the signing of a new START treaty in 2010. Nevertheless, many of Obama’s other “Prague theses” concerning nuclear disarmament have still not been implemented. For instance, the United States has not yet ratified the CNTBT, which prevents the treaty from coming into force. Talks on a treaty to ban production of fissionable materials, which Obama expanded on in 2009, never started. Moreover, North Korea has since carried out two nuclear tests, and suspicions about Iran’s nuclear program have only increased. Meanwhile, the new Offensive Reduction Treaty, in spite of all its pluses, has shown that neither Russia nor the U.S. will be ready in the coming decade to cut their strategic weapons below the levels set by the 2002 START Treaty. On the day Obama spoke in Berlin, the Russian president declared that Obama’s proposals were impossible to implement at present. “We cannot allow the balance of the strategic deterrence system to be upset, to lower the effectiveness of our nuclear forces,” Vladimir Putin said during a meeting on the state defense contract. The multilateral nature of any future nuclear disarmament talks is not the only Russian condition for continued nuclear reductions. Russian leaders have set out these conditions more than once since 2009. First, Russia and the U.S. should comply with their commitments under the new START, under which cuts would only be completed in 2018. Second, any nonstrategic nuclear weapons cuts urged by Obama in his Berlin speech would only be possible once American nonstrategic nuclear weapons were withdrawn from Europe. Third, any future nuclear weapons cuts should be carried out in the context of measures to prevent weapons from being deployed in outer space, to limit development of non-nuclear strategic weapons and to limit development of the U.S. anti-ballistic missile system. The RBTH comix: A new round of US-Russia negotiations. CLICK TO READ MORE. So, in fact, Russia’s answer to Obama’s proposals had been formulated before the American president repeated them in Berlin. Russia’s stance can be summed up as the following: Russia will not agree to cut its strategic nuclear forces before 2018 and reduce nonstrategic nuclear weapons, so long as U.S. nonstrategic nuclear forces and infrastructure are on European territory. By the same token, after 2018, cuts would be possible if the ABM problem were solved, development of space weapons and non-nuclear strategic arms were limited, and other nuclear powers joined the disarmament process. Obama must have known these preconditions when he spoke about disarmament in Berlin. What was the aim of his initiatives? Having recognized in Prague that the goal of a nuclear-free world “will not be reached quickly – perhaps not in my lifetime,” Obama, a true idealist, probably expects that, in 50 years’ time, some other American president might recall his Berlin speech, standing on the threshold of a nuclear-free world. At the same time, to come up with any initiatives in such a difficult sphere as disarmament, one has to remain “an idealist without illusions,” as Kennedy described himself. Judging from the Russian response to Obama’s proposals, the “world of peace with justice” and the “world free of nuclear weapons” referred to by Obama are, so far, ideals that have nothing in common with the real interests and possibilities of its future inhabitants. Alexander Kolbin isa research fellow and coordinator of the Russia and Nuclear Non-proliferation Program at the PIR Center.